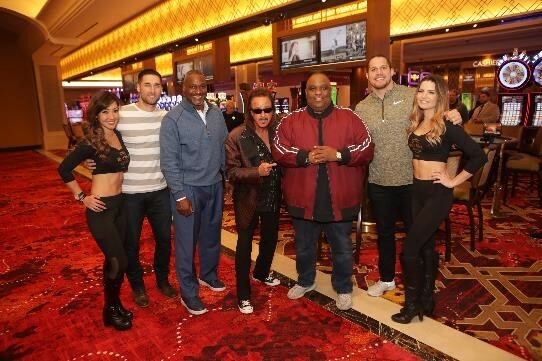 The Seminole Hard Rock Girls are joined by (left to right) Kevin Kiermaier, Derrick Brooks, Jimmy “The Mouth of the South” Hart, Orlando Davis and Anthony Chickillo at the world debut of One Card Blackjack. The world premiere of One Card Blackjack – a new table game – took place at Seminole Hard Rock Hotel & Casino Tampa on Wednesday. Local media and celebrities participated in a ceremonial “first hand” and ribbon cutting. Among the celebrities in attendance were Derrick Brooks (former Tampa Bay Buccaneers player), Kevin Kiermaier (Tampa Bay Rays), Orlando Davis (WiLD 94.1), Jimmy “The Mouth of the South” Hart (WWF/WCW/WWE personality) and Anthony Chickillo (Pittsburgh Steelers). To play against the dealer, guests must make a bet in the designated area. The King, Queen and Jack count as 10, the Ace counts as either 1 or 11, and all other cards count as their face value. Suits are of no significance. If the player’s initial card is an Ace, it is considered a “Blackjack” which is paid even money. When both the dealer’s and player’s initial card is an Ace, this will constitute a push. In addition to the One Card Blackjack table game unveiling, the property introduced $100 Match Play for new Seminole Wild Card Members. Match Play is a promotional offer issued as vouchers to use at a live table game. Guests must first sign up for a Seminole Wild Card, which is free at the Player’s Club. New Seminole Wild Card holders will then receive $50 Match Play after signing up and $50 Match Play upon their next visit. Once issued, Match Play vouchers are good for use within 24 hours. They can be used at a favorite Blackjack, Baccarat or Pai Gow Poker table. Even money bets only. With venues in 76 countries, including 185 cafes, 27 hotels and 12 casinos, Hard Rock International (HRI) is one of the most globally recognized companies. Beginning with an Eric Clapton guitar, Hard Rock owns the world’s most valuable collection of music memorabilia, which is displayed at its locations around the globe. Hard Rock is also known for its collectible fashion and music-related merchandise and Hard Rock Live performance venues. HRI owns the global trademark for all Hard Rock brands. The company owns, operates and franchises Cafes in iconic cities including London, New York, San Francisco, Sydney and Dubai. HRI also owns, licenses and/or manages hotel/casino properties worldwide. Destinations include the company’s two most successful Hotel and Casino properties in Tampa and Hollywood, FL., both owned and operated by HRI parent entity The Seminole Tribe of Florida, as well as other exciting locations including Atlantic City, Bali, Cancun, Daytona Beach, Desaru Coast, Ibiza, Orlando, Shenzhen and San Diego. Upcoming new Hard Rock Cafe locations include Piccadilly Circus and Oxford Street in the United Kingdom, Djerba, Tunisia, Gran Canaria, Spain, and Chandigarh, India. New Hard Rock Hotel, Casino or Hotel & Casinoprojects include Berlin, Budapest, Dublin, London, Los Cabos, Madrid, Maldives, New York City, Ottawa, Sacramento, Dalian and Haikou in China. In 2018, Hard Rock International was recognized as a Forbes Magazine Top Employer for Women and Land Operator of the Year at the Global Gaming Awards. For more information on Hard Rock International visit www.hardrock.com.